Thanks to you, students, staff and friends of MCCN delivered more than 350 presents to the students at Avondale School for their annual holiday party on December 19. Brooke Buckley, Erica Roggenkamp, Kali Pace, Courtney Banks and her dad, Cierra Beaumier, Dorothea Salens and her daughter Anna, Sarah Bishop, Victoria Lawyer, Nick Dreyer, Yuliya Fonin, Ellen Strickler, Director of Campus Ministry Ellen O'Shaughnessy, DMin, and her husband Bob all helped deliver the gifts and watched the children receive them with delight. On Saturday, December 13, several members of Campus Ministry joined students from Columbus College of Art and Design and Columbus State through Downtowners Campus Ministry to help provide food boxes and spread cheer to those in need at Bethlehem on Broad Street, a Christmas mission program organized by Broad Street Methodist Church. Over the course of the day, more than 1,200 boxes of food, contributed by Holy Trinity Lutheran Church, were distributed. Each year, MCCN sends interested students to participate in Nurses Day at the Ohio Statehouse. Organized by the Ohio Nurses Association, the annual event brings together nursing advocates with state legislators to discuss policies and issues important to nurses. 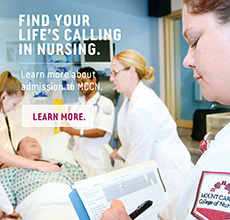 It’s a great opportunity to see how public policy intersects with nursing at the bedside. The library’s Jingle Bells & Books 2014 was a rousing success. Not only did attendees enjoy the choir from Avondale Elementary School and the MCCN Chorus, but guests also enjoyed the chocolate fountain and other sweets and savories. As a result of the Avondale giving tree being displayed in the library, more than 50 gifts were collected for the elementary students at the event. Thanks to the generosity of our colleagues and students who made this celebration truly enjoyable for all involved. Mount Carmel Outreach doesn’t just touch lives; it changes them for the better. That’s why it has been chosen as the beneficiary of Mount Carmel Foundation’s 2015 Champagne & Diamonds Gala, to be held on Saturday, February 14 at the Hilton Columbus at Easton. Held in the College Gym on December 5, many MCCN students enjoyed the Winter Wonderland formal. In addition to a DJ, the event featured food catered by Chipotle and a photo booth. As part of our ongoing series to profile faculty, staff and student representatives, this month we feature student Katelyn Snider. I can’t live without… my family and my dog!